My Brothers, Yesterday, I received the new 2011 calendar. When I turned to the month of June my heart stopped. A Police Unity Tour Rider looked back at me. That rider is Jersey City Police Officer Jane Louf. We tragically lost Jane to suicide on August 1, 2010. Jane and I enjoyed a Father/Daughter type relationship. I met her when she became a Hudson County Sheriff’s Officer. No one could miss her, not even in a crowd. She always wore a smile that melted the heart of anyone who looked at her. We never lost contact after her transfer to the Jersey City Police Department. On that tragic Christmas night in 2005, Jane and her partner chased after Rob and Shawn on the Lincoln Highway Bridge attempting to warn them that the bridge was open. She watched in horror as the ESU truck plunged 45 feet into the water below. Jane’s partner actually had to prevent Jane from jumping off the bridge in an attempt to save them. This and many other tragedies were carried around by Jane for years. Here was a beautiful girl with a beautiful smile who was crying on the inside. During my first Unity Tour Ride in 2008 I met a mental barrier when we approached the bridge in Delaware. I was convinced that I could not make that bridge. There appeared Jane Louf and Mike Stise, Jane saw in my face that I was ready to quit. She told me “ Put your head down and don’t look up. Keep peddling and I’ll stay with you all the way.” I made it! Nothing was impossible to me over the next three days. Jane and I had a long conversation during the 2010 tour. I was upset that I was not on my bike with my team due to setback and had to settle for a ride in the trailer. Next thing I knew Jane was in the trailer with me and in distress. God sometimes places people together in strange ways and circumstances. Now I understood why I was off my bike. When I learned of Jane’s suicide I partially blamed myself for not calling her in over a month. I know from my training that I cannot save everyone but I hear her words over and over in my head “I’ll stay with you all the way.” I feel like I did not do the same for her. I truly believe from what I learned and experienced that suicide by a police officer can sometimes be justified as “In The Line of Duty”. When you do what I do you come to understand that so many officers carry around a lot of job related issues over the years. They are faced with administrations that don’t care about their mental health, peers that look upon them as weak, distrust in municipal programs, fear of losing their jobs. Jane’s name will not be placed on the memorial wall but I take great solace in knowing she was partly responsible in raising the funds for it over the years and seeing her face in the 2011 calendar. From the bottom of my heart I thank you both and all the staff that work so hard to keep memories alive. May God send you all his Blessings. Tomorrow, families across the country will join together, many traveling great distances, to celebrate the Thanksgiving holiday. Unfortunately, far too many will be celebrating without a beloved family member. This year alone 145 law enforcement heroes have been killed in the line of duty, a 45% percent increase from this time last year. 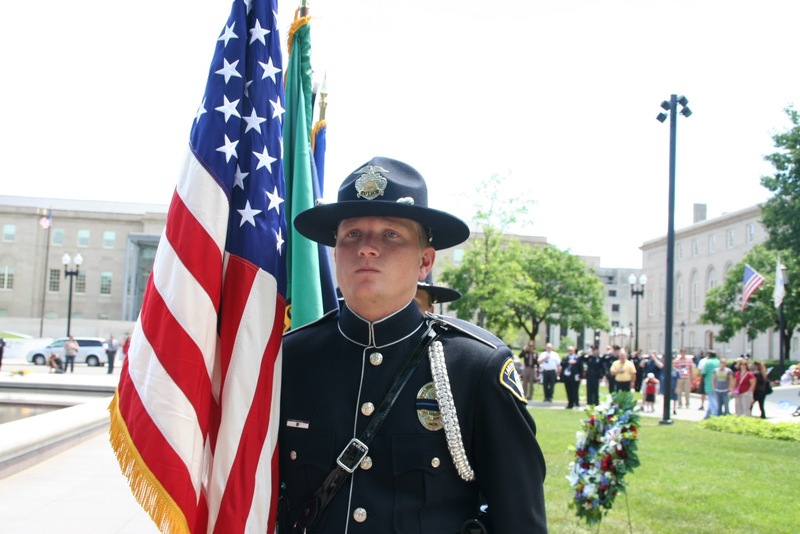 The Memorial Fund expresses our gratitude and thanks for all of America's law enforcement officers, especially heroes who have made the ultimate sacrifice. 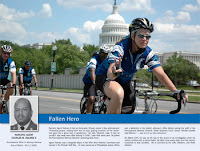 Officers such as Hector Ismael Ayala of Montgomery County (MD) Police Department. Officer Ayala was responding to a call when his police cruiser crashed into a tree. He left behind a wife, Melissa, and four children, including triplets born in this June, shortly after Officer Ayala's death. And Officers Brandon Paudert and Bill Evans of the West Memphis (AR) Police Department, who were conducting a routine traffic stop when they were brutally shot and killed. Two other officers were injured trying to catch their killers. Officer Paudert's father, Bob, is the Chief of West Memphis. 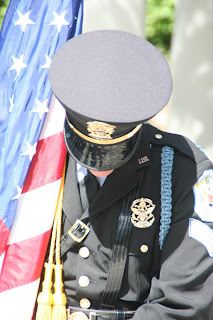 Everyday law enforcement officers work to protect and serve the American public. The holidays are no exception;they give up time with their families to protect our travels and ensure our safety. And for this, we are truly thankful. As the nation pauses to honor its military veterans, the Memorial Fund encourages you to remember the 29 men and women killed in the line of duty while serving as law enforcement officers, abroad and at home. The law enforcement connection runs deep with numerous officers serving in both America's military and law enforcement.